Hello and welcome to the 41st installment of the SWD. City of Azaz north of Aleppo in TFSA territory was hit by an VBIED today, in case some are not familiar with “situation” in Azaz, it usually experiences a VBIED or even a suicide attack every month or two because the city has a notable IS-cells presence that no one is trying to eradicate for now. Fortunately today’s attack wasn’t as deadly as the previous ones but still it unfortunately killed at least three civilians. Several pro-rebel sources created huge and unnecessary mess by falsely reporting that Tadef is captured by TFSA. Commander in TFSA later denied reports about them capturing Tadef after the withdrawal of SAA. Tadef does seem to be empty and the reason for that could be that it is being used as a buffer between TFSA-held Al-Bab and SAA territory in order to avoid any confrontations. Northeast of Deir Hafer SAA captured Um Tinah village from IS. With yesterday’s capture of Rasm al-Fallah, Um Tinah was besieged from all sides by SAA and it was only a matter of time until it was captured. As it was said in yesterday’s Daily the most likely reason why SAA hasn’t entered Deir Hafer yet is because they are waiting for sappers, today this “claim” was reinforced with reports that SAA is waiting Russian sappers from Palmyra to finish demining it before they start to demine Deir Hafer. Liwa Suqur al-Raqqa, part of SDF claimed they fully captured Tabqa airbase from IS, this claim is very huge and should remain unconfirmed until footage can prove that SDF captured airbase. Capture of airbase seems to have happened very quickly since clashes were reported around it just yesterday, but then again IS might have just withdrawn from it towards Raqqa. It is finally known which areas were areas recaptured by SAA in a counterattack that happened two days ago and they are Kawkab, Tell Abadah and Shayzar Castle, village of Shayzar is reportedly under fire control. Pro-rebel source reported that in Kawkab alone there were ~40 killed rebels, mostly HTS. HTS-led offensive appears to have been contained by SAA, NDF and allied militias since they weren’t able to advance today like they did previous days. This doesn’t mean that clashes stopped, heavy clashes do continue and rebels launched a dozen of TOW missiles targeting various “military vehicles and equipment”, one even targeted SAA infantry south of Muhardah killing a small number and wounding many others. HTS started another attack on Qomhane today which was reinforced by SAA and Qalamoun Shield forces since the previous attack. It was reported that the attack started with an SVBIED which was destroyed but a local reported stated that no SVBIED targeted Qomhane. Heavy clashes continue on the outskirts of the city and rebels were unable to advance into it, at least not for now. Northern Hama offensive launched by rebels postponed the evacuation of the 2nd batch of rebel fighters and civilians from al-Waer, Homs. Evacuations should resume once the fighting dies down in the area. SAA started their own “offensive” against rebels in Jobar, after recapturing everything lost to rebels yesterday, new positions were captured in Jobar some of them held by rebels for years. 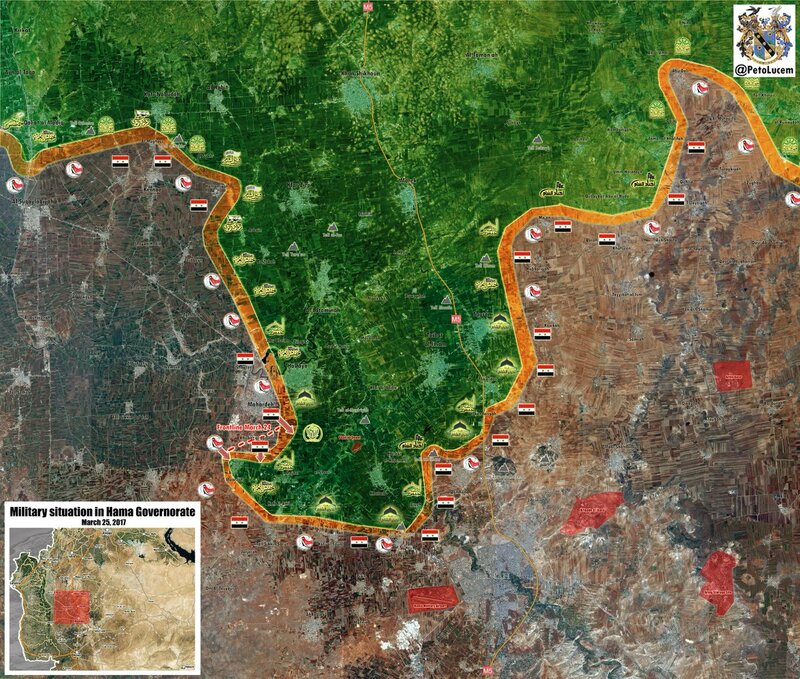 Failed offensive which now looks like it was a distraction for Hama offensive appears to have hurt rebels since they lost a lot of valuable soldiers that were keeping SAA at bay along the front line. SAA‘s offensive on Qaboun-Barzeh pocket resumed and allegedly SAA was able to capture some points in Tishreen district, remains to be seen if true. Daraa front was stable for some time after the rebels launched offensive and SAA reversed some gains, however, according to pro-government source SAA started a new offensive in Daraa and allegedly captured many buildings since morning, location of these captures is unknown and this claim about offensive does seem false, but just so it’s out there if it actually amounts to anything. In the eastern part of the governorate in Lajat area Southern Front backed by Ahrar al-Sham and Hayaat Tahrir al-Sham captured a number of localities from IS including village of Hawsh Hamad. 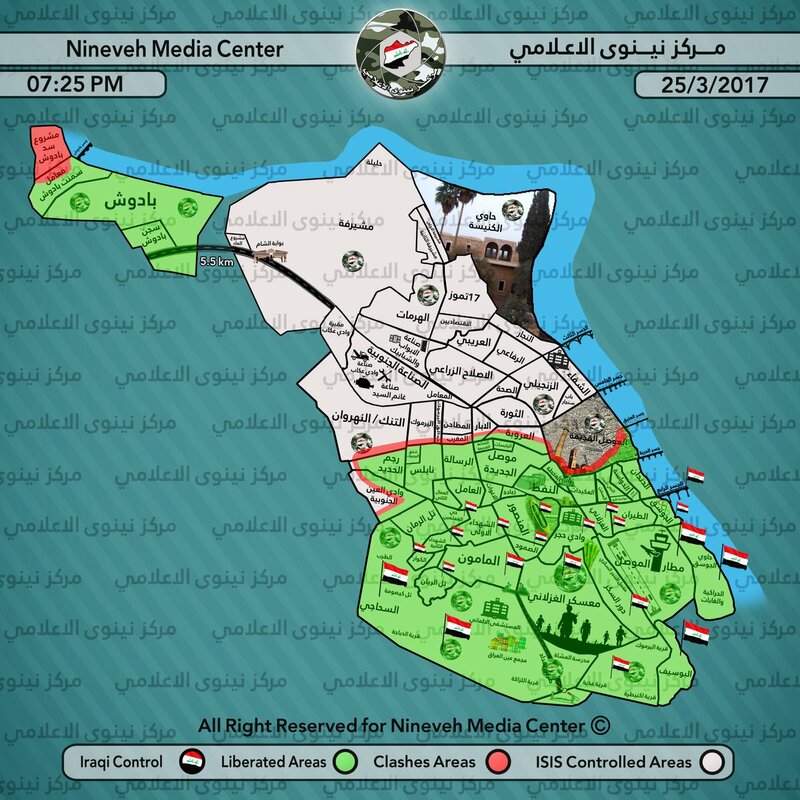 Clashes continue all over west Mosul between Iraqi Army and IS with the former capturing almost all of Rajim Hadeef district. In Tamouz district according to the reports IS committed a new massacre, around 120 civilians were executed when they tried to leave the district. Rumors surfaced that Mosul operation is being postponed due to “high” civilian casualties but these rumors were quickly denied by Iraq Joint Operation which stated that Mosul operation is not going to be stopped and that forces continue advancing against IS. 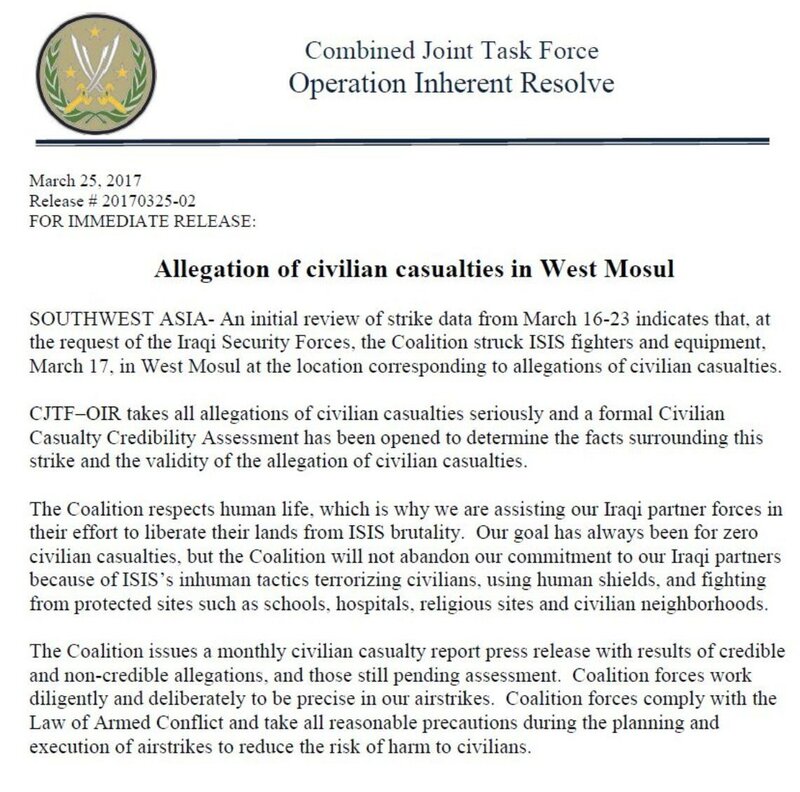 In a new statement CJTF-OIR confirmed that they have unintentionally targeted on March 17 civilian area which caused more than 200 deaths. Keep in mind that it was reported that Iraq Joint Operations denied that an airstrike occurred targeting civilians. On the 24th of March 2017 CJTF-OIR has conducted 22 strikes in Syria. CJTF-OIR‘s main focus in Syria at the moment is Deir al-Zour-Raqqa region where they did 22 strikes supporting SDF‘s operation against IS destroying seven fighting positions, five vehicles, three improvised bombs, two tunnels, and a vehicle bomb; damaged five supply routes and a bridge; and suppressed an IS tactical unit.